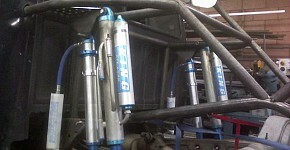 American Motorsports is located in Escondido/San Diego and specializes in off road fabrication. We specialize in Toyota, Ford and Chevrolet Long travel kits, Cab Cages, Front and Rear Pre Runner Bumpers and 4-link rear suspension. We also offer sales and installation on all your favorite bolt on lift kits and accessory from Pro Comp, Fabtech, Terra Flex and many more. 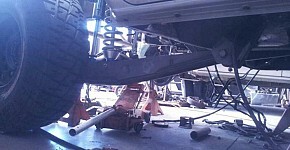 Our company provides top quality parts and service for off road vehicles as well as street vehicles. All off road fabrication is done with mig and tig welding processes working with steel, stainless steel or aluminum. The majority of our work has included: suspension design and fabrication, suspension installation, roll cages for both street and off road, front and rear off road bumpers, bed cages and fiberglass fender installation. Our company provides unique R&D designs that utilize drawings in 3D with the Solid Works CAD program and CNC machined parts and components. We believe our skills and manufacturing quality speaks for itself and we maintain our customer's satisfaction and safety as our utmost priority. American Motorsports prides itself on quality engineering, manufacturing, design and welding that it puts in to every project and kit that is turned out from its doors. Our company is not limited by any project or ideas that you may have and we welcome them all. Please contact us with any inquiries, we welcome them all and hope to make our name a recognized and respected brand. Thank you!